Heat oven to 350°F (325°F for dark or nonstick pan). Line 13x9-inch pan with foil, letting foil hang 2 inches over short ends of pan. Spray foil with cooking spray. In small bowl, mix caramel topping and 1 tablespoon of the cake mix; set aside. In large bowl beat remaining cake mix, butter and egg with electric mixer on low speed about 1 minute or just until crumbly. Stir in oats, using hands if necessary. Reserve 1 cup oat mixture. Using a piece of plastic wrap on crumb mixture, press remaining oat mixture in bottom of pan; remove plastic wrap. Bake 14 to 18 minutes or until light golden brown. Sprinkle chocolate chips and walnuts over hot crust. 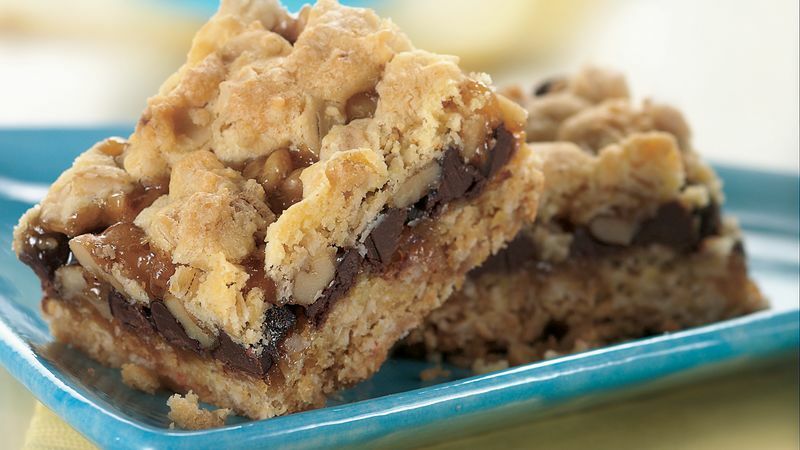 Drizzle caramel mixture evenly over chocolate chips and walnuts to within 1/2 inch of edges. Crumble reserved oat mixture over top. Bake 20 to 25 minutes or until golden brown. Cool completely, about 2 hours. Using foil to lift, remove bars from pan. Remove foil. For bars, cut into 6 rows by 4 rows. Store covered. Be sure to check your oats to see if they are the quick-cooking kind. Don't use instant oatmeal, which will become mushy when it's baked in dough. Not a nut lover? Go ahead and leave them out. The bars will be just as gooey and delicious. It’s best to bake bars in the exact pan size called for in a recipe. Bars baked in a pan that is too large will overbake and be hard. Those baked in a pan that’s too small can be doughy in the center and hard on the edges.